Little Scoring = Good Defense? Good question, is low scoring due to good defense? This weekend may be proof positive that it may be just a lack of strong offense. To that point it was Bulldog play-by-play announcer Bruce Ciskie who said the Saturday game looked like a Bemidji State - Alaska Anchorage game. Not high praise, but an indictment of the boring, lock-down style of play. One of the struggles of the 2012-13 Bulldogs was the five on five goals. Friday night saw two UMD goals both with teams at full strength. Penalty kill was up to the task going a strong 11 for 11 for kills on the weekend. A college football coach once asked "Are you hungry, or are you starving?" The Bulldogs could be asked the same taking a 1-0 lead into the third period both nights only to allow MTU to tie the score. Friday UMD did answer with a winning goal. Whereas the penalty kill is rolling, the power play is struggling going 1 for 9, BUT giving up a shorthanded goal in the process. Defense and goaltending is still in the neutral category. If the difference between win, tie, and loss will be as razor thin as it was this past weekend, wins will be rare unless the defense can really lock it down. The new motto and mantra may have to be "If they don't score, we don't lose." Next Up. The Bulldogs find themselves in Colorado Springs next weekend for their first series of the NCHC. CC has played just one game, an exhibition 8-4 win over the US U-18 Developmental team. The score is impressive and reminds me of the 1980's college hockey. UMD is young again this year and will be tested on the road to open up the new conference schedule. It is just like old times for the Bulldogs. 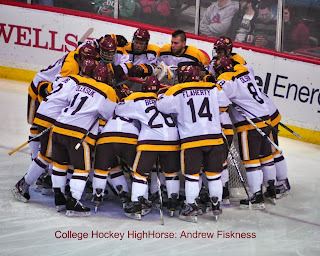 Starting in a new conference may be daunting and unfamiliar, but UMD will start with a known opponent, Michigan Tech. UMD has played Tech more times than any other team in program history. A total of 223 time with Tech holding the decisive edge 119-84-20. The Huskies and Bulldogs have faced each other at least four games per season since the WCHA instituted the rival and pod system of scheduling. The teams are no longer in the WCHA together, but the partnership lives on. This time it is a warm up for each team as they prepare to enter their respective conferences. The facts are that UMD historically doesn’t do well on opening weekends/series. Their last sweep of one opponent on opening weekend was back in 1995 with a series win at the Maverick Stampede Tournament in 2002. Without much to say about teams that have a new season in front of them we will go onto the picks. 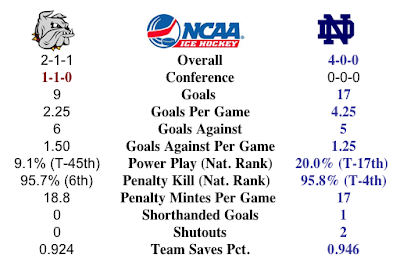 Western Michigan vs. Notre Dame (home/home series): I will go with the safe pick and say a split series. Michigan Tech @ UMD: I like Duluth more in this series but UMD historically struggles opening weekend. Split. Bently @ Nebraska Omaha: The Mavericks should be too much Falcon's, UNO sweeps. Vermont @ North Dakota: Vermont wasn't very good last year and being on the road to start this season will be tough. North Dakota sweeps. Bemidji @ Saint Cloud State: The new fight anthemfor the Huskies should really get the players pumped for the game, Huskies sweep. Merrimack @ Denver: I think Jim Montgomery will be able celebrate his first win as the new coach for the Pioneers against the Warriors this weekend, but only one win. Split. Miami vs. Ohio State (home/home series): Miami should be the better team, but I will go split with the home/home series. 1. Who will be the goalie who steps up to be a reliable number one? Aaron Crandall and Matt McNeely are the candidates and neither looked like they could be the backstop a contending college hockey team needs. One of them needs to step forward and take the job. 2. Will the offensive potential output outgun the defensive potential struggles? The Bulldogs can and will score. The struggles will likely be if the young defensive corps can keep the scores against in the 3-3.5 range instead of the 4-4.5 range. Tim Smith and Andy Welinski will be key mainstays of the defense. 3. Is the NCHC the best conference and will the high caliber teams keep each other out of the NCAA Tournament? 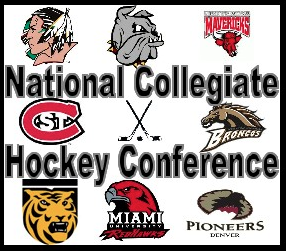 The NCHC is a great conference, arguably the best top to bottom. But in the end, will the "better" teams beat each other up and ultimately keep some high end teams out of the NCAA is a concern. Stack a league, decrease chances for their NCAA chances? Quite possibly. For now, we have to wait to see what the expectations look like on the ice starting tonight at AMSOIL Arena.